This dangerously toxic element belongs to the actinide group. It is one of the most expensive and rarest naturally occurring elements, found primarily in pitchblendes and ores from Zaire. Protactinium is an a-emitter and poses as a hazardous threat similar to plutonium. The element was isolated for the fist time in 1934 by A. V. Grosse. 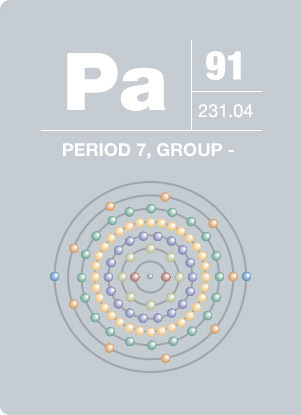 In 1961, the United Kingdom Atomic Energy Authority was able to produce 125 grams of 99.9 percent pure protactinium which processes about sixty tons of waste material – a supply of the element that would last for many years to come.